Are you looking to increase the livable space in your home without a pricey addition? If so, a basement remodel is right for you. Basements already have flooring, electric, and plumbing–they’re much more affordable than an above-ground addition. In fact, you can finish out space you already have and see as much as 60 – 70% return on your investment. Whether you’re trying to boost your home’s value or find a little more elbow room, a basement remodel is where it’s at. 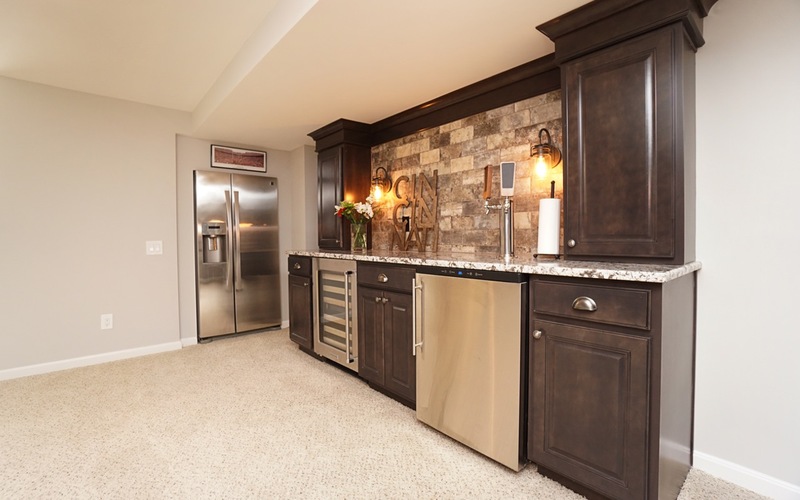 Check out our favorite tips to get the most bang for your buck for your basement remodel. A basement remodel is an exciting addition to any home. It’s easy to get carried away in the planning phase, particularly when choosing the basement’s new function. Will it be a man cave or a she shed? How about an in-home movie theater? Or even an indoor bowling alley? Before you get too excited, remember to keep your basement design flexible and reasonable. You can’t go wrong with adding a living room, bathroom, office, or bedroom to expand your home. Sure, these ideas aren’t as wild and fun as a home theater, but they’re much more likely to help you sell your home. Not every buyer wants such a specific, niche space like a movie theater or wine cellar. By adding traditional living spaces, you can get the most return on your money by appealing to the majority of buyers. That said, you still have many options for designing a flexible subterranean space in your home. Make the most of your home with an in-law suite that can either be rented out or used to accommodate larger families. A play room or a home gym are also great neutral options that buyers will find hard to resist. Basements have a reputation for being dark, creepy, and dreary. But nobody wants to live like a vampire! 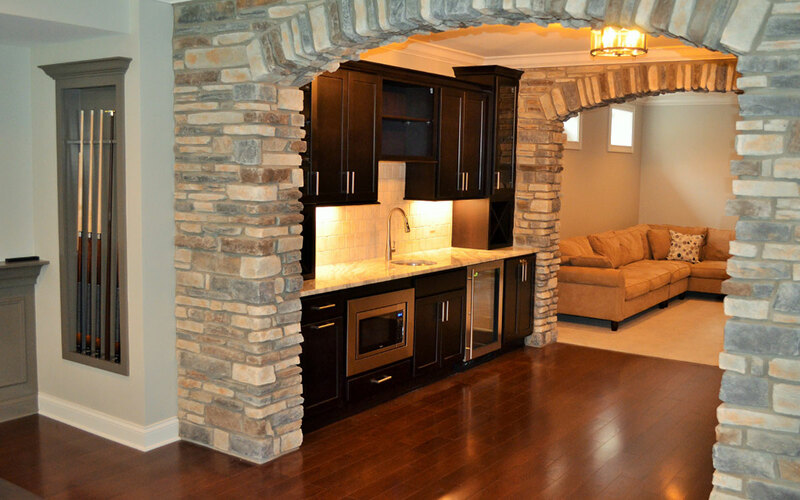 When designing your basement remodel, allow for tons of space and light to open up the room. The ceilings should be at least 8 feet tall, for both construction and aesthetic purposes. This will make the remodel feel larger and more luxurious. It’s also best to give your basement space an open floor plan. This naturally makes the room feel larger, and it’s on-trend with open floor plans that buyers crave. If your basement already has walls, make sure they aren’t load-bearing before tearing them down! It’s nearly impossible to incorporate natural light in a basement. Get creative with artificial light sources. Be generous with the lighting options, offering recessed lights or lamps to increase the light in your remodel. Don’t forget to add plenty of mirrors to make the space feel less cramped. Basements are naturally prone to moisture. If you cut corners during your basement remodel and skip waterproofing, your remodel will be ruined. Before your basement finishing, fix foundation cracks, dehumidify the space, and choose moisture-resistant materials like non-wool carpet tiles. An addition can boost your home’s value, but it’s not the easiest fix for homeowners looking for more space. Remodel your basement to increase square footage and earn up to 70% of your investment back during a home sale. Not sure if a basement remodel is for you?  When in doubt, partner with a trusted remodeler like Destefano Homes and Remodeling to walk you through the process. Custom Homes: Worth The Hype?